Guest post by Jack Viktor. Ok, so you did everything in Part 1!? Good. You’ve now over-practiced a move that you will now use for the rest of your life, especially in walk-around performances. Be happy, cuz this next part is long but easy.At this point, your overhand shuffle should be second nature. If you can walk around your house, and run an entire deck while keeping count, you’re now efficient at this move, and you should be able to pull this off in front of laymen no problem. Now for the easier step. All you have to do is change your finger position. Instead of your thumb directly on the back of the card, you’re pulling off at the long edge. Simple. *Again, I would really recommend getting Aaron Fisher’s Pathways Vol. 1 video. He recommends placing your thumb at the back of the card close to the long edge to run cards off. In my opinion, it helps with the discrepancy that can occur in later controls when you switch between running blocks and running singles. So a Kata for running blocks is as follows. Do multiple shuffles with each subsequent shuffle adding 1 more movement – Essentially, start off by shuffling the deck in two blocks. That means you thumb off half the deck, and throw. Pat down, square up, and do the shuffle again, only this time, thumb off a third of the deck, then another third, and throw the last third on top. Pat down, square up, and repeat, increasing the number. Another Kata for merging blocks and running cards will come when you start learning controls, so I’ll save it for then. That should be the point that you look for, and, personally, I think this is found through practice. Before we move on to the controls and tricks, I would like to ask an important question. This is an important question because it pertains to a lot of the bad habits that are formed early on with most magic, and as a “returning” beginner, it’s one that I would like to nip in the bud (or at least bring to light so you can’t say you weren’t told about it). Every action you do in a trick, whether its picking up the cards, how you’re shuffling them, or even how you hold them has to have MOTIVE. That means (in an overtly pretentious phrase) “Every Action Has A Reaction”. When you shuffle a deck, what are you doing? When you control a card or a packet during an overhand shuffle, what are you doing? Yes…they’re the exact same. You’re doing two “different” things, but to a spectator, they are the same thing, and they elicit the same reaction. Some of you might disagree (which is a good thing). You would argue that it should be You’re making the audience think you’re randomizing the order in arrangement only YOU know, but here’s the problem with that thought process. Magicians have a huge problem: We’re magicians. We’ve delved behind the curtain of secrecy. We have crossed a line that we seemingly cannot cross back over. We can never NOT know that there’s always a method. And once you cross that line, it’s tough to recognize what a spectator sees versus what you may “think” you see. For you, you see a sneaky moment when you’re doing dirty work, and that’s true. But try this. Film yourself shuffling a deck of cards. Then put them down. Can you honestly tell yourself you know where any specific card is in the pack? No. Now film yourself, only this time memorize the bottom card and control it to the top. Can YOU tell the difference between the two clips? Yeah, cuz you’re looking for what you’re doing. But ask a spectator what they see, and if you’re good, they won’t see anything. They’ll just see you shuffling cards. Still doesn’t make sense? Figures. I’m not that smart. But you know who is smart? Darwin Ortiz. His books Designing Miracles and Strong Magic discuss this topic in immense detail. Ken Weber’s Maximum Entertainment is also a good in learning the practicality of delivering an entertaining magical performance. Eugene Burger…nvm, you’re a beginner. These books are not important…yet. You’ll need to look these names up sooner or later, but when you do, I hope you keep in mind the lesson that I was trying to bring across. 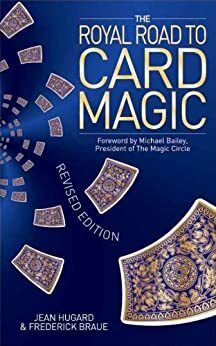 This last lesson was meant to be more of an introduction to a question that “hopefully” you will ask yourself as you go through the controls and tricks that you learn through this wonderful book. Also, I would like to apologize for the lack of posting these on time. College laziness mixed with summer time sleep is not good for productivity. Part 3 should be up sometime this week. This entry was posted in Huzzah!, magic and tagged card magic, card tricks, magic, royal road. Bookmark the permalink. Whatever happened to Part 3? When the person I’m re-posting (with permission!) writes it, I’ll post it here.